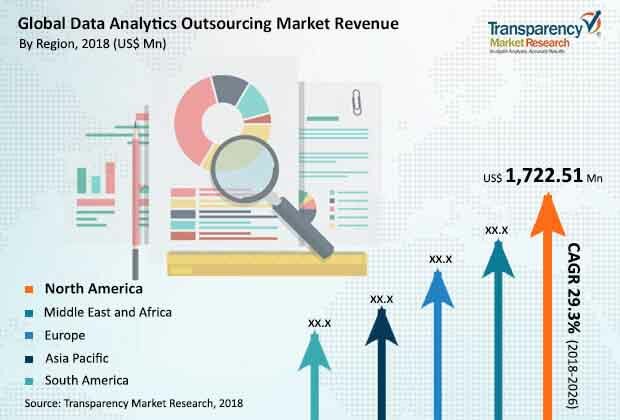 According to a new report published by Transparency Market Research, the global data analytics outsourcing market is expected to reach the value of US$ 20,681.1 Mn by 2026 on account of the exponential growth in data generation and lack of in-house capabilities of companies. The global data analytics outsourcing market is projected to expand at a CAGR of 29.4% during the forecast period, viz. from 2018 to 2026. The growth of the market can be ascribed to the rising demand for advanced data analytics services across industries and the high adoption of marketing analytics by companies in order to offer the best possible services to their clients. North America is anticipated to be the fastest-growing market for data analytics outsourcing, and is likely to be followed by Asia Pacific, Europe, Middle East & Africa, and South America during the forecast period. The BFSI segment of the data analytics outsourcing market is expected to grow rapidly, primarily due to the rising demand for data analytics in the BFSI sector across the world. The data analytics outsourcing market is presently in the emerging stage and is anticipated to grow swiftly in the near future due to the rise in awareness regarding the advantages of data analytics and the increase in productivity of the companies who adopt the same. Enterprises are enhancing their profitability and efficiency by using business software systems such as customer relationship management (CRM), enterprise resource planning (ERP), and supply chain management (SCM). These systems have resulted in an exponential increase in data related to operations, customers, and suppliers. Additionally, due to rise in the usage of Internet, there is an enormous amount of structured and unstructured data available to organizations. This has led to the demand for data analytics in organizations in order to have an in-depth analysis of their data and generate meaningful insights from it. The data analytics outsourcing market has been segmented on the basis of application and industry. Research shows that the global data analytics outsourcing market was dominated by the BFSI sector with a significant market share in 2016, as BFSI is the earliest adopter of data analytics services and there has been a rising demand for data analytics in the sector across the world. The BFSI sector has increasingly been adopting outsourcing of data analytics to understand changing consumer preferences, minimize risks, and reduce costs. This has improved the productivity of BFSI companies. The BFSI sector drives the data analytics outsourcing industry with most of the companies largely targeting this vertical. However, emerging verticals such as manufacturing, healthcare, and IT & telecom are also showing high growth in this market. In terms of application, the marketing analytics segment constituted the dominant market share in 2016, and is expected to retain its position during the forecast period. Adoption of marketing analytics is high as it helps companies in better decision making and also increases their return on investment (ROI). Marketing analytics enables marketers to manage, analyze, and measure their marketing performance in order to increase its effectiveness and optimize return on investment, which is expected to help the market grow rapidly. In order to offer the best possible service to their clients, companies are spending heavily on marketing analytics-based applications. Retail and manufacturing are more inclined toward outsourcing of data analytics due to wide use of marketing analytics by these industries. North America led the global data analytics outsourcing market with a substantial share in 2016. This is primarily due to the increasing adoption of data analytics outsourcing and technologies and tools of data analytics by companies in the region. The data analytics outsourcing market in North America is growing at a significant rate. Rapid increase in data generation from different industry verticals such as BFSI, manufacturing, and healthcare is one of the major factors driving the data analytics outsourcing market in South America. On account of new opportunities, the data analytics outsourcing market in Asia Pacific, Europe, Middle East & Africa, and South America is expected to rise at a significant rate during the forecast period. The research study includes profiles of leading companies operating in the global data analytics outsourcing market. Key players profiled in this report include Accenture, Capgemini, Fractal Analytics Ltd, Genpact Ltd., IBM Corporation, Infosys Ltd., Mu Sigma, Inc., Opera Solutions LLC, RSA Security LLC, Sap SE, Tata Consultancy Services Ltd., ThreatMetrix, Wipro Ltd., and ZS Associates Inc.